I love Jean Foillard's wines. There are many great Beaujolais wines, but if I were forced to choose only one to drink (and thank goodness I am not), I would choose Foillard's wines. And I say this without even having tasted only half of the wines he makes. The Morgon wines from Côte du Py and Corcelette I've drunk many times and based on these wines, Foillard makes my favorite wines from the Beaujolais. I've never tasted the other Morgon wine, also from Côte du Py, called Cuvée 3.14, a wine made from old vines, and I think from un-grafted rootstock. You know, 3.14 as in π, as in pie, as in franc de pied (French rootstock). But I don't know this for a fact, I'm merely speculating. Until the other night, I'd never tasted Foillard's Fleurie either. But a good friend opened a bottle of the 2007 the other night (about $40, imported by KERMIT LYNCH), and it was absolutely lovely. This wine opened slowly, as Foillard's wines tend to do, the nose building to a crescendo of ripe Gamay fruit and flowers, wet stone underneath. The palate is elegant and shows great intensity and focus, and without weight, exactly the kind of thing that makes Burgundy and Beaujolais lovers swoon. The wine is well structured and firm, but lighter in body and more nimble than, say, Foillard's 2007 Morgons. It has the same power, but is even wispier. I am not someone who can speak intelligently about the soil composition in Morgon versus Fleurie, but I think that comparing Foillard's wines is helpful in trying to understand the two terroirs. As Bert Celce of Wine Terroirs writes in his excellent and informative profiles of the Foillards, "Be it Corcelette, Côte de Py, Fleurie, Morgon, they vinify all these Gamays the same way (including the "lower" cuvées), which means that whatever differences you'll find (especially when comparing similarly-old vines), it will come from the terroir particularities." On another note altogether, did you notice in the photo that this bottle looks different from Foillard's other bottles? Yes, the label is black, as is the wax coating the capsule. But I'm talking about the prominent message on the front of the label that says "Imported by KERMIT LYNCH." I have nothing but respect for Kermit Lynch and I would not presume to criticize his decisions regarding the wines he imports, or anything of that nature. But because appearances are such trivial matters, I will nitpick a little here. This message is apparently now on the front of all of the US-bound Foillard wines, and I don't like it. It's kind of like watching Goodfellas, but with a constant graphic on the upper right part of the screen that says "Produced by BARBARA DeFINA." She was of vital importance in bringing Goodfellas to audiences and everyone thanks her, but she wasn't the creative force behind the film, and if I want to know who produced the film, I can look. It doesn't seem all that classy to have that information front and center. Nitpicking -- finished. Thank you. In the past few weeks I had the opportunity to drink 3 old Nebbiolo wines, all courtesy of my old pal Deetrane. These wines were fascinating, and they were incredibly delicious, even if in one case, only for a short window. Friends, I have a whole new problem now. I must have more, I absolutely must. The first wine was from the 1978 vintage, a Barbaresco Asili. We think the wine was by Ceretto, although the label said Azienda Bricco Asili. My hopes were not high, as the cork was a crumbly dried out mess. We decanted and let it sit for 15 minutes or so, and the wine was not impressive, with acidic red fruit jutting out and a somewhat musty finish. But another half hour in and the wine had harmonized and the aromas were gentle with truffles, spices, and earth. The wine was well balanced and still showed good youthful acidity. But this lovely window lasted for only about 15 minutes, and then the wine unraveled and became a bunch of rather tired component parts. Could be a storage issue, or it could simply be what happens with some old wines. You get a short window, especially if you decant. The following week we opened a great bottle of wine from one of Barolo's step-children, Gattinara, the 1971 Le Colline Gattinara Monsecco Conte Ravizza Riserva Speciale. (Bad photo, sorry) Deetrane bought a few of these bottles and after drinking one, he was excited to share. Before and as we opened it I harbored suspicions, based on the perfect condition of the bottle and the cork, that this wine had been re-conditioned, perhaps topped up with young wine. Who knows? I loved this wine. We did not decant and the wine was great immediately, with earthy truffle smells that hinted at orange peel and cherry. The nose on these things! Truly intoxicating. The wine built in intensity over the hour it was open, becoming more and more vibrant in its flavors. This was beautiful wine and I want to drink it again, this time with a plate of noodles dressed with butter and white truffles. Actually, I don't care what I eat with it. I just want to drink it again. And then, on a recent evening in which I was feeling a bit gloomy, Deetrane decided to open a ridiculously special bottle to share, the 1962 Gaja Barbaresco. These iconic bottles sometimes scare me, especially when I am lucky enough that they are opened to share specifically with me. What happens if I don't love it the way I'm supposed to? Nothing to fear here, as this wine was utterly majestic, one of the finest wines that I have ever drunk, and I say that with absolute conviction, like GW Bush in 2003 declaring the end of the war in Iraq on that aircraft carrier. Only I'm right about this - the wine was fantastic. The color was a very pale rose petal/orange, much lighter than it looks in the photo. Vibrant and energetic on the nose, truffles, roses, spices, orange peel, youthful (!) cherry fruit, and the smells were so well defined and pure. Perfectly balanced and harmonious, it really spread throughout the mouth and nasal cavities, leaving this truffle and rose scent in its wake. It was growing as we finished it too. This was the kind of wine that makes you re-evaluate your own wine cellar. Thanks to my then girlfriend, now wife BrooklynLady, sometime in 2004 I rediscovered wine. I had no idea, really, of what it was that I liked (and I'm still figuring it out). I mostly bought daily drinking wines, but I also made the occasional purchase of a special bottle, something a bit more expensive. I didn't yet know where to look for meaningful information about wine, but I wanted to spend my money wisely. One of the things I used was a vintage chart. I still have it, actually. Think about it - there are so many bottles on the shelves, so many choices on auction sites. How can some one who is serious about getting into wine, and on a limited budget, sort through it all? The vintage chart is such a helpful tool, like a cheat-sheet. Before buying a special bottle I always made sure that the vintage received a high rating on my sheet. And if it got a low score, or if the vintage wasn't listed on the sheet, I would pass. I know now that this is an absurd way to buy wine - to think about wine, even. But that's only because I now know enough to understand how much I don't know. When you're starting out, a vintage chart helps to make sense of the enormous set of wine choices. Then you learn aphorisms like "good producers make good wine in all vintages," and perhaps you focus more on terroir and producers. And one day you spend $75 on a great producer's villages Burgundy from 2004, and you realize that it might be true that good producers make good wine in all vintages, but there are better ways to spend $75. It's all part of learning about wine. I won't understand the mistakes I'm making now for a few more years. I think about vintage now when I buy a special bottle of wine, but I think about them according to my own taste and experience. Because I am attracted to wines made in a lean and graceful style, I find that I prefer wines that come from quiet vintages that don't attract attention. For example, I really like the Loire red wines from 2007. This was a typical year with a typical set of problems, and no one declared it to be a blockbuster vintage. 2005, on the other hand - a vintage of the decade. I would bet huge sums of money that I will prefer the 2007's in 15 years, but time will tell. I don't know a lot, but I'll tell you this: when it comes to "great vintages," it's better to decide for yourself. And who cares if you wind up liking a vintage that the critics deride? You'll enjoy your wine and pay less for it too. I was reminded of all of this the other night when I had the good fortune to attend an amazing wine dinner at Alto put together by the inimitable Levi Dalton. You may have heard about this, as my pals at Do Bianchi, McDuff's Food and Wine Trail, and Rockss and Fruit were also in attendance and have already written a bit. We drank Nebbiolo made by Peter Weimer of Cascina Ebreo in Novello. His flagship wine is called Torbido!, although it is made in a place and in a style so that would normally be called Barolo. We drank several vintages of Torbido!, beginning with the first ever vintage of 1997, and including 1998, 1999, 2000, 2001, and 2004. We also drank the 2002, although it was released as Limpido!, not Torbido! Jeremy Parzen of Do Bianchi told me, "Peter Weimer allows the vintage to express itself, he doesn't force the wine to become something it isn't." Drinking these wines, then, was an amazing opportunity to learn something about vintages in Barolo. Which ones would I prefer? Take another look at the vintage chart. 2000 and 1997 are rated as essentially perfect vintages. Everything, in fact, with the exception of 2002, is supposed to be very good. My experience was a bit different. I liked most of the wines very much, although there was one that I found essentially undrinkable. That was the 1997. To me, it was a shapeless wine with no focus, and the fruit had an oxidized character. It had no energy, and seemed out of balance to me. I would drink the passable 2002 over the '97 every time. But there were at least two other people at the table who preferred the 1997 to any of the others. I did like the 2000, the other blockbuster vintage according to my chart. It was not as profound as other wines on the table, but it was balanced and somewhat expressive, and entirely drinkable. I didn't like the 1999 so much at first, as it had a diffuse and overripe character on the nose that was very similar to the 1997. But I came back to it later on and it was truly a lovely wine - good energy, clean ripe fruit, good acidity, and quite harmonious. Jeremy said that it was the most classically styles of the wines, and I think I understand what he meant. My personal favorite was the 1998. I loved the pungent truffley aromas and the fine grained tannins, the intense and yet graceful character of the wine. The 2001 was clearly a beauty, but like the 2004, it was showing only a little bit of itself at this early stage of its life. Who knows what they will become? This was a solid reminder for me that regarding wine vintages, as with most everything else, I'll always be happiest when I do my own thinking. This is the final post about my conversation with Neal Rosenthal. It was a great experience for me to spend time with him, and I hope that you've enjoyed reading about it. We talked a bit more as we finished our lunch. BG: So if you don't do trade tastings, how do you get the word out about your wines? How do you grow your business? NR: The best publicity is word of mouth and longevity. I've been doing this for over 30 years and I've hung around by doing a really good job, and by respecting the customer, by the quality of service that I offer. I've been able to make a nice living doing something that I adore, and without compromising my principles. BG: Aren't there a load of new restaurants opening all the time, places with local and artisinal sensibilities? How do you draw new venues into the fold? NR: That's why we added Clarke (Boehling), the first new sales rep I've hired in seven years. We realized that we wanted to get everywhere that we should be, and Clarke is helping us do that. BG: I don't know how anyone can keep up with all of the changes. NR: You know, I think that young consumers and young people in the wine trade have been cheated out of opportunities to drink old wine. I remember when the great old restaurants in the city like Lutece and La Caravelle would buy their bottles of Bordeaux, and they would put it directly into their cellars. They bought the wine but they had no intention of selling it for years. They wouldn't even put it on the list! That's not happening anymore and it's really a shame. And it's part of why wine is made differently now. Wine is made to drink young now, to gobble down. They relax the tannins, keep the acids low, bring the fruit forward. There's no point in aging those wines, and now it's hard to find old wine that's been stored properly. BG: Do you keep old bottles of your wines? NR: Yeah, we can go down and have a look in my cellar in a little while. BG: (Wiping drool from mouth) That would be awesome. So have you ever had experiences where you like a wine and want to import it, but you think that people won't buy it? NR: Of course, but I usually buy the wines anyway. You go out and find an audience for the wine. Especially now that my customers are so savvy, so experienced. My Swiss wines, for example. It's hard to sell a $30 bottle of Swiss wine. How many Swiss restaurants are there to sell it to? BG: Are you successful with those wines? NR: Not yet, but we will be. It's exciting to work with a group of people growing those grapes and making those unique wines. Eventually people will drink them and find joy in them. And listen, you can have convictions, and still be wrong. I believe in these wines and I enjoy the challenge, so I do it. BG: I want to ask your opinion on a few hot-button issues, of late. What's your take on the Natural Wine phenomenon? BG: What about the debate over shipping wines over state lines? NR: I think it's a phony issue. There is a viability to the three-tier system. Distributors have a role to play because they get out on the street. They're the ones who open the wines for potential customers, they make sure the wines are placed, they take the re-order. BG: But if I were to move to a state that doesn't allow out of state shipping, I couldn't buy your wines, for example. NR: Yes, there should be a more open market, but access to wines happens because one person in Memphis demands a wine, other people too, and then a distributor buys the wines. BG: I guess so. What are the things that you still want to accomplish in your business? NR: Hmmm. (Thinks for a moment). I'd like to fine tune the portfolio, to ensure that our growers are making wine the way we're used to, that they're not compromising. And with that, we started walking through the house to the stairs that lead to Neal's underground personal wine cellar. ND: By the way, what are your hobbies outside of wine? NR: I'm a long distance runner and I'm quite serious about it. I'm an age-group winner in a half-marathon and I've run several marathons. I've been politically involved, but I'm giving that up in frustration. I still love to write, and farming - I spend a lot of time on that now. And I love to follow my daughter's career, she's the editor of the National Interest journal. Her name is Justine Rosenthal. BG: How did you get into beekeeping? NR: Some of the winemakers I work with keep bees and I always found it fascinating. A few years ago I decided to try it myself. BG: What's your take on the mass bee die-off a few years ago? NR: There are lots of scientific theories about that, but I think it's pretty simple, actually. Here's what's actually happening with the bees. There are people who keep bees and they travel around the country with the seasons, and sell their services to farms all along the way. We are overworking them, plain and simple. They travel all the time and work all the time, and that's not the way it was meant to be. The more they work, the weaker they become, and the more susceptible to disease. We walked into the wine cellar, a large room with two aisles, gravel floors, and cement slabs for shelves. there are boxes piled up and piles of wine in the shelves. It's a beautiful thing. And it is not temperature controlled - Neal says that because it's underground, it's not necessary to regulate the temperature. BG: Oh, so those are just some magnums of Carillon Bienvenues-Bâtard-Montrachet. NR: That's very good wine. NR: Do you know about Gaudichots? It was part of La Tâche, but then DRC bought most of it up and had it re-classified as Grand Cru. Gaudichots is a great vineyard. BG: It must be so much fun to have a cellar like this. NR: Yes, it really is. Finished with our tour of the grounds, we went inside the house for a look around. Neal showed me his root cellar, where he grabbed a bunch of his potatoes for our lunch. There were rows of jarred tomato sauce and other preserves, made from the fruits of his farm. Also many rows of Italian food products - anchovies, honeys, olive oils, and more. NR: These are food and cooking products that we import from Italy. I haven't figured out how to sell them yet (he shrugs). BG: (picking up a jar of utterly beautiful rosy pink anchovy fillets) These look beautiful! Are they for cooking or for eating? NR: I cook with them, but you could just eat them. Then we passed a large shelf where 50 or more bottles of wine stood. NR: These are wines that we'll drink soon. BG: Nice! I have a bottle of that wine, the 2004 Pradeaux. BG: Yup. I have the regular wine too. NR: The Longue Garde is a very special wine. It's made only in the best vintages, and it's old vines pure Mourvedre. It's a spectacular wine (he smiles). At that moment, and via that exchange, I felt like I understood something about Neal Rosenthal that cannot come through simply by reading this dialogue. He was genuinely happy. Perhaps because I have the wine, perhaps because he enjoys telling people about his wine, but it seemed to me, that he was happy just because the wine exists. BG: You'll taste these all in the next few weeks? NR: Kerry and I drink a bottle of wine with dinner every night. We have to drink our wines in order to see where they go, to keep up with them. They are evolving constantly and I need to understand them. I've made a career on tasting wines young and having a sense of whether they will age well, or be better young, but I have to check on them to follow their development. BG: Do you drink wines from outside of your own portfolio? NR: Of course. It is the height of hubris to think that your own wines are the best or among the best wines if you don't drink the other wines. Now we walked upstairs and through the living room, into the kitchen. Neal told me to sit down at the table, and he began to make lunch. He opened a bottle of wine for us to share, the 2005 François Gaunoux Meursault 1er Cru La Goutte D'Or. He began washing and cutting potatoes, and cooking them in a cast iron pan. He seasoned them simply with salt, pepper, and a bit of dried red chili flakes. Neal made the egg batter for our omelets, and we talked some more while he cooked. I noticed that there were no lights on in the house. There was no need - it was a sunny day and the windows allowed in a lot of natural light. We didn't discuss this, but I'm sure that he enjoys not having to turn on the lights. BG: So, do you read about wine on the internet? NR: I do, but not so much. The thing is, I'd rather read online than read the boring repetitive useless stuff that the critics write in those magazines, you know the ones, they come out every three months or so. Their wine vocabulary encompasses 20 descriptors and a point score. That is useless. Wines shouldn't be written about that way. They write only about the physical characteristics of a wine, but they don't discuss the exuberance and joy of drinking the wine. BG: So what are the internet sites that you like? NR: There are a few, but you know, on the other hand, a lot of what's online can be fairly uneducated and that can be dangerous. I'm occasionally tempted to write a response when I think that some one is misunderstanding a wine, misinterpreting it. But I don't because once you do that, it becomes argumentative and that's not where I want to be. BG: So how do you keep building your wine knowledge? NR: By tasting and drinking. I cannot spend as much time tasting as I used to, there's just not a lot of time. Most of the tasting I do is in Europe with growers, the growers I work with and others who I don't work with too. BG: I know that you don't do trade tastings. Can you tell me your thoughts about that? NR: The only way to understand what we do is face to face, not in a mass group tasting experience. We like to get 10-12 people together and drink wine, talk about it. If you have hundreds of people in a room sipping and spitting hundreds of wines, what's the point of that? You cannot understand our wines that way. Not only don't I need to do tastings like that, I despise them. They reduce wine to the most base commercial level. Neal stopped cooking and looked at me. NR: We have to protect what's best about wine. It is ancient in our civilization, it is a perfect mix of the intellectual and the sensual, it enriches our lives. The beauty of great wine is that it lives inside of you after you've had it. It's a stimulus for memory. What it tasted like, but more importantly, what it made you feel, why you drank it, what you talked about while drinking it, and with whom. Wine is a social event, not fodder for criticism. We sat down to lunch. There is no yellow or orange food coloring in that omelet - the eggs were very fresh. NR: Do you like the wine? BG: I really do. When you opened it I could smell it before you even poured it. How do I pick wines to bring for Thanksgiving, Brooklynguy? What should I do, Brooklynguy, because I have to pick the wines this year? It's my responsibility to get wine for our dinner this year, and I don't know what to get. What should I buy? I'd be curious to hear your thoughts on Thanksgiving wines, Brooklynguy. None of the above are questions that were asked of me, although I'm going to pretend that they were. Here's how I pick wines for Thanksgiving - I remember that in my family, the only person who cares even a little bit about the wines is me. No one wants to discuss the wine. But they know that I'm into wine, so they expect a 2 minute explanation about the wines I brought. Not more than two minutes though, and keep it simple. So I bring wines that I want to drink, but also wines that I imagine my family will also enjoy because they smell and taste good. And I try to keep things low in the alcohol department because there will be driving in traffic, and more importantly because I don't want it to be my fault when a family member gets awkwardly weepy and declares their firm intent to see more of the rest of us. I like to drink sparkling cider while hanging out before the meal, and my family does too. They don't hate it, anyway. It feels festive and it's low in alcohol. Three producers whose ciders I buy without hesitation - Julien Frémont, (Louis/Dressner Imports), Eric Bordelet (JD Headrick Selections), and Cyril Zangs (Savio Soares Selections). This year I'm bringing one of Bordelet's pear ciders, the 2009 Poire Authentique. At 4% alcohol, I just cannot see things getting out of hand for anyone. I'm also bringing 2009 Bisson Prosecco Treviso (Imported by Rosenthal Wine Merchant) because it's very tasty and accessible, and at 11% alcohol, this bottle will not directly result in too many abusive comments amongst my family members. None of those bottles costs more than about $15, unless you buy the fanciest Bordelet Ciders which are beautiful, but also drier than the turkey you will very shortly be forced to eat. I'm bringing white wine too, and nothing terribly creative - Mosel Riesling, thank you very much. Why not, really? It works well with the food, the sweet orchard fruit makes people happy,and the saw-like acidity makes me happy. In my family, I seem to be the only one who drinks white wine during thanksgiving dinner, so if I want to drink 2008 Knebel Riesling Trocken and 2009 Peter Lauer Saar Riesling Barrel X, then that is exactly what I shall drink. These are both imported by Mosel Wine Merchant, cost around $15 each, and are legitimately excellent wines. You might be surprised to hear that I am also bringing red wine this year. I would bring Beaujolais, but the ones that I like the most cost at least $20 per bottle, and I'd prefer to spend less. I know it's a bit bulkier than is ideal, but I tend to bring Loire Cabernet Franc wines to Thanksgiving dinner because people expect their red wines to be brawny and dark, and I certainly do not want to rain on my family's parade. So I'll bring 2007 Filliatreau Saumur-Champigny La Grande Vignolle, $18, Louis/Dressner Imports and 2007 Domaine Guion Bourgueil Cuvée Prestige, $14, Fruit of the Vines Imports. These wines are actually far more graceful and balanced than people might like, but they are delicious wines that will make people happy and whose spicy undertones should pair nicely with the frustrated political discourse and inappropriate career advice that will flow freely during dinner. 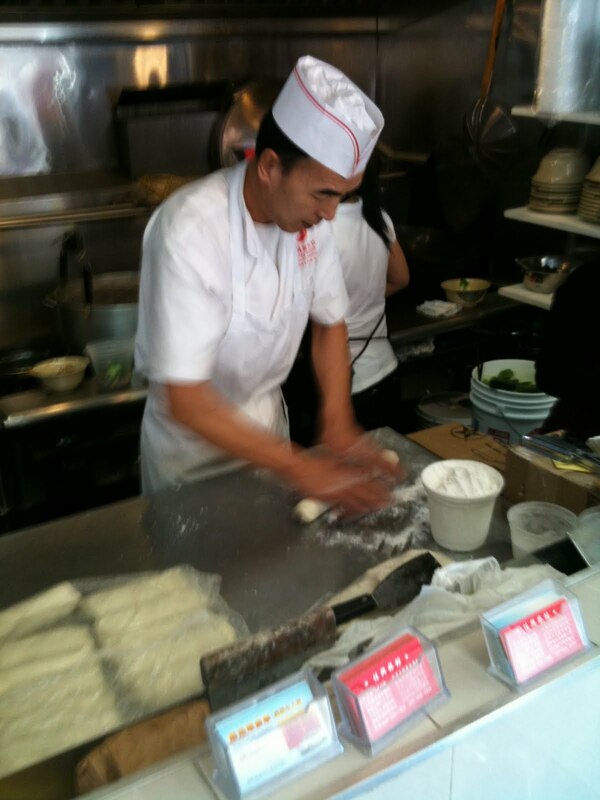 As much as we all love ramen, there are other delicious noodle soups to be had in NYC. 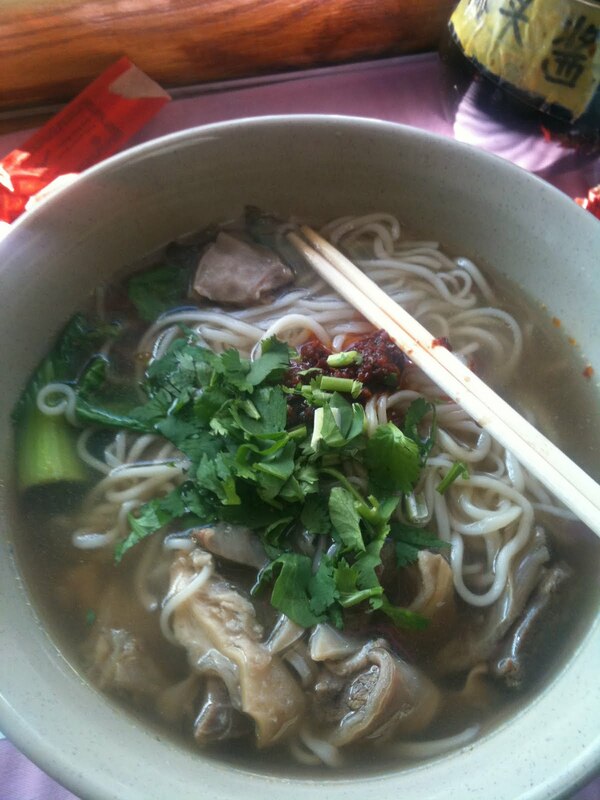 Consider Phở, the Vietnamese dish. These are rice noodles in beef broth seasoned with charred onions, star anise, and other spices. 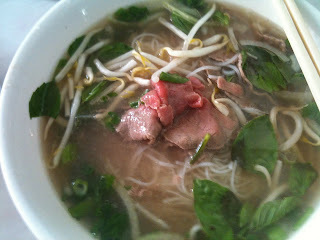 My bowl in that photograph is topped with thin slices of very rare beef, but phở is often topped with beef or fish balls, a grilled pork chop, or any other kind of meat. Tear a bit of holy basil, scatter a few bean sprouts, and add the condiments of your choice to a little side dish - I like ground chili paste and nước mắm, Vietnamese fermented fish sauce. My favorite phở in NYC, and honestly I've tried very many of them, is at Cong Ly at 124 Hester Street. 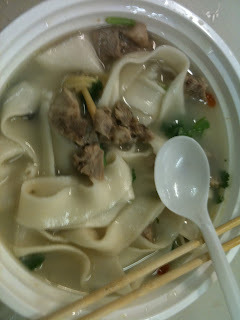 Then, there are lamb noodles. It takes days to simmer the lamb bones and meat for this beautiful broth. At Lamb Noodle Soup in the Golden Shopping Mall food court, 41-28 Main Street in Flushing, it is aromatic and very clean tasting, and yet deeply lamb-y. These are wheat noodles and they were made in front of our eyes. I wanted to drizzle this bowl with the fiery roasted chili paste sitting on the table, but my almost 4 year old would have none of it. 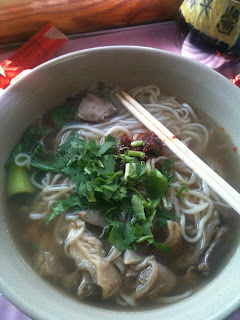 So instead we ate our lamb noodle soup unadorned, and it was truly fantastic. 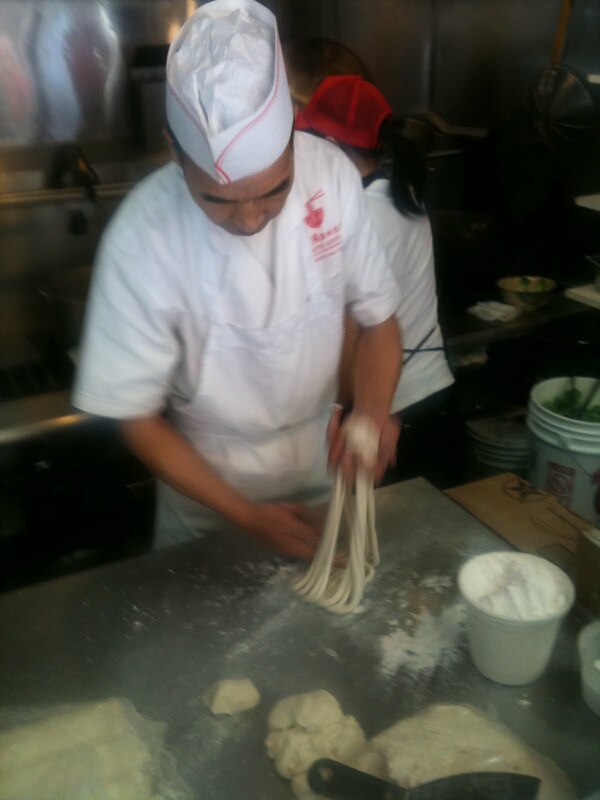 And these are hand pulled noodles from Lan Zhou, a Northwest China specialty. I took some noodles, broth, and beef stew and put them in little daughter's bowl before hitting it with the chili paste, chunkiang vinegar, and cilantro. These are also wheat noodles, and also made by hand - hand pulled, to be exact, pulled right before we ate them. In fact, for your viewing pleasure, here are a few pictures that capture that process. 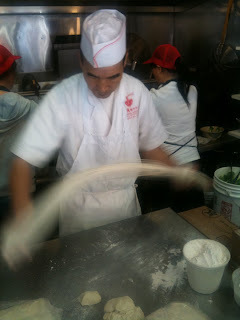 It starts with a piece of dough the shape of a sausage. This guy is an absolute pro. 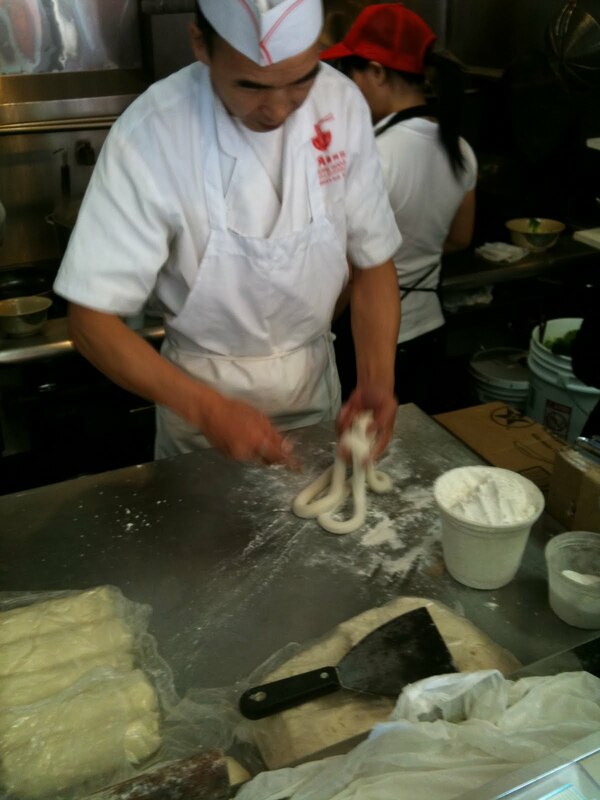 With quick and smooth hand movements, he thwacks the dough a couple times, turns it back on itself, and he has it in loops. Things sped up here. Several more pulls and turns, and there are many more loops, thinner now, of course. And then suddenly there was a kind of combined thwacking and pulling, one final pull and into the pot. This place is at 5924 8th Avenue in Sunset Park. Have you ever eaten a watermelon radish? They look like turnips on the outside, except that the tail has a pink hue under the skin. They are very mild as far as radishes go, and they are very beautiful, bright fuchsia on the inside. Every year beginning around now, I impose watermelon radishes on my family and the friends who come over to eat. My typical cooking technique is to slice them and cook them simply in butter and salt, and to serve them alongside a main dish. But last weekend at the market, Bill Maxwell (I like to think of him as my family's farmer) told me that they're great raw. And so it was decided. I decided to make a salad using watermelon radishes, but what else should go in there? Have you noticed that salads at good restaurants always have walnuts or pumpkin seed oil or some sort of nut in them? I decided that a small handful of coarsely chopped walnuts should be part of the equation. And as I mixed things together I realized that as much as I love watermelon radishes, they would need to share the stage with something else. I had a bunch of good kale, and so it was decided. Shreds of kale - kind of bitter. Slices of radish - kind of spicy and savory. Pieces of walnut - kind of nutty and rich. To balance it out...a bit of ricotta cheese - kind of sweet and creamy. For the dressing, olive oil and sherry vinegar - kind of acidic and very savory. My plan was to eat this before some leftover roast chicken and turnips, but that went out the window as soon as I tasted the salad. A larger serving, and that was dinner. And a healthy one at that. There was no question in my mind that I would drink Sherry with this dish. But as I put the food on a plate I began to think of another wine, and imagined that it would be good. I'm wrong lots of times, my friends, but this time I was right. I drank the 1998 López de Heredia Rioja Rosado Viña Tondonia Gran Riserva, $25, Polaner Selections. Funny, among those I've tasted, this is not my favorite vintage (that would be '95), but I've enjoyed this wine every time I've had it. This was the best bottle yet. It took a half hour for the aromas to knit together, and then it was a completely harmonious and deeply complex, utterly drinkable and satisfying thing of loveliness. Mushrooms, crabs, orange water, musk, rocks, Sherry...those are the things that I thought about while smelling this wine. And this bottle showed such a compelling length and energy. It was truly great with my salad, although it's hard to imagine a meal that this wine would not compliment. By the way, you know that López de Heredia waits a long time to release their wines, unlike almost every other winery in the world. The idea is to release them when they believe they are ready to drink. I'm starting to believe that the Rosado, like their other Gran Riserva wines, shows best if you give it even a few more years in the cellar. The 1998 did, in any case. Let's see if I can show some self control with my 2000's. Can you get geared up for a laundry list post? I hope so, because here comes one. Do you, dear reader, ever wonder.."Does that Brooklynguy ever drink anything that he doesn't write about on his blog?" Yes, I do. Here are the wines I drank in October that have not, even in passing, appeared already in October on this blog. I am including in this laundry list the wines that I drank at home (mine, or a friend's home) with a meal. I will rate these wines according to my own carefully thought out, sustainable, local, and hand-crafted scale. The "excellent" group consists of wines that are truly memorable, wines that inspire me to seek out and buy these and wines like them. The "excellent" and "very good" groups are wines that I would happily buy at the given price. All other wines, even if I liked them, are not wines that I would buy today given my recent experience with them. Doesn't mean that I think they are bad, just that there are other wines I would prefer to buy with that money. Within each group, I will list the wines in the approximate order of enjoyment. Organized enough for you? --1985 Domaine Huet Le Mont Demi-Sec, price and importer unknown. --2004 Alzinger Riesling Smaragd Loibner Steinertal, $30, Imported by Michael Skurnik Wines. --NV Equipo Navazos La Bota de Manzanilla Nº 16, $39, Eric Solomon Selections. --1998 Hudelot-Noellat Vosne-Romanée 1er Cru Les Malconsorts, $75 at auction, Old Vine Imports. --1985 López de Heredia Rioja Viña Tondonia Gran Riserva, $83, Polaner Selections. --Lustau Almacenista Fino del Puerto Sherry Matured by Jose Luis Gonzales Obregon, $23, selected by Christopher Cannan, Imported by Europvin USA. --2004 Domaine de Bellivière Jasnières Les Rosiers, $28, Louis/Dressner Imports. --2009 Coudert Clos de la Roilette Fleurie, $20, Louis/Dressner Imports. --2009 Domaine de la Pépière Muscadet de Sèvre-et-Maine Sur Lie Clos des Briords, $16, Louis/Dressner Imports. --2009 Peter Lauer Riesling Barrel X, $18, Imported by Mosel Wine Merchant. --2005 François Chidaine Montlouis-sur-Loire Les Tuffeaux, $20, Louis/Dressner Imports. --2008 Jean et Gilles Lafouge Auxey-Duresses 1er Cru La Chapelle, $30, Imported by Fruit of the Vines. --2008 Reinhard & Beate Knebel Riesling trocken, $14, Imported by Mosel Wine Merchant. --2007 Jacques Puffeney Poulsard "M," $25, Neal Rosenthal Imports. --1999 Foreau Vouvray Sec Clos Naudin, price unknown, Neal Rosenthal Imports. --2000 Le Vieux Donjon Châteauneuf-du-Pape, price and importer unknown. --NV (based on 2007) Diebolt-Vallois Champagne Brut Blanc de Blancs, $48, Imported by Petit Pois Corp.
--2007 Mas de Gourgonnier Les Baux-de-Provence, $13, Imported by Michael Skurnik Wines. --2006 Domaine Oudin Chablis Les Serres, $22, Jenny & François Selections. --2009 Wimmer-Czerny Grüner Veltliner Fumberg, $16, cannot remember the importer. --2005 Belle Pente Pinot Noir Murto Vineyard, Oregon, $32. --1985 Mas de Daumas Gassac Vin de Pays de l'Hérault, $40 at auction, importer unknown. --2007 Montevertine Pian del Ciampolo Toscana IGT, $26, Neal Rosenthal Imports. --2007 Nigl Grüner Veltliner Privat, $38. Imported by Michael Skurnik Wines. --2005 Domaine des Croix Bourgogne, $25, Becky Wasserman Selections.